After a solid twelve months of training, the Whaiora Spirited Women – All Women’s Adventure Race was finally upon us. For only the second time since signing up, The Alterno Accidentals were all together in the same place! Arriving around midday on the Friday gave us all a chance to register and get our race pack, which was bursting with goodies, and have a look at all the things available at the expo. After dropping the bikes off at the newly-revealed location, we watched a couple of inspiring short films and, for some of us, participated in our first yoga class. The race briefing on Friday night was very informative and gave us a chance to size up our opposition. As we took it all in, we realised we were well-prepared and had done everything we could to be successful in completing the event. After the race briefing we went back to the motel and planned our route for the short course. The open-water kayaking had some of us excited and some of us a tad apprehensive but we’d got this far – no backing out now! Saturday dawned almost perfectly for racing: not too hot, a bit of cloud cover and a touch of wind to keep us cool. We got dropped off near the start line by Abby’s mum and dad who had come down to support us for the weekend and had a good amount of time to do some final warm-ups, check the maps for anything we had missed and to soak up the atmosphere around the start line. Abby was decked out with her birthday balloon and we were ready to go. Then we were off!! We had self-seeded ourselves towards the back, being walkers not runners, and it enabled us to take our time down the beach and, more importantly, watch how some teams were entering and exiting the surf on their kayaks. The paddle round to the first control went reasonably well considering we hadn’t done any training in swells as big as what we encountered (mental note for next time) and once we had the first control sorted, the nerves eased off a bit. Coming back in on the kayaks proved a bit more challenging and Megan and Abby capsized with just metres to go. However, with no injuries sustained and nothing lost off the kayak, it was all part of the adventure. The trek up the cliff helped dry us off after the kayak and it certainly was a trek! The multiple climbs up Mt Tauhara (for Megan and Kait) and Mt Kaukau (for Penny) certainly paid off. We passed a group that was heading in the opposite direction saying they were lost already and that certainly gave us a lot of confidence knowing that at least we knew where we were. Penny had spent quite a bit of time in the region in her youth so the path around the headland was familiar and that helped give the team confidence. The next section involved a detour to see if we could find an easier path down into the basin on the farm. Kait took a tumble over a fence, cutting her hand on the barbed wire and losing her compass and water bottle at the same time. Once these were retrieved, we decided to go back down the road and take the easier option. We had talked as a team about not following everyone else but when there were so many women on the course, it was difficult NOT to follow everyone and watch what yonder team were doing near that thing that looked like it could be a control point. Once at the bike transition the cold pizza came out and we were well nourished for the next section. The downhill ride along the farm road was a fabulous way to get into the bike leg and it felt great to whizz along knowing that because we had planned our route, very little attention had to be paid to the map secured on the map board on Kait’s bike. The first mystery activity got Abby all excited because she had shot her first deer earlier in the year and wanted to prove that she was a crack shot. The team scored 7/8 which was pretty fabulous and a big thanks to the lovely people from the gun club patiently telling every single competitor the same thing over and over again all day! The next section was pretty challenging from a biking perspective but the uphill climbs were all made worthwhile with the amazing views over the gorgeous countryside. The downhill was quite steep and much of it involved walking the bikes. We had made sure our training involved distances longer than what we would come across on race day so walking our bikes for any length of time was never going to be an issue. The ford crossing was a welcome distraction then the long flat country road was some of the easiest riding we had done in all our hours of training! Next stop was the second trek which involved the long, hard climb up to the aerial mast on top of the Pa site. it was clear to see why early Maori chose the site as somewhere to see their enemies coming from all directions – only in this case, the hill WAS our enemy! Down the other side and the thought of the water slide was making us go that little bit faster. Again, watching other teams go first helped us with our strategy. Kait’s was to attempt as many 360 degree turns as possible. Megan’s was to not get hurt. At least we achieved 50% of our goals: Kait got a huge cheer and round of applause, Megan twisted her shoulder trying to retrieve Kait’s hat that had been flung off on the first spin but was well attended to by the medics on course. At least it happened towards the end of the race! Back onto the beach, with Kait insisting on carrying Megan’s running vest (secretly trying it on for size) as well as her own pack, it suddenly dawned on us that we were almost finished. It also dawned on Megan that we were close to our six hour goal time. We broke into a jog and crossed the finish line looking almost as fresh as when we had started some five and a half hours previously, though considerably more dirty! The feeling of elation that everything we had been working towards for the past 12 months had finally come to fruition was incredible. The relief that we got all the controls and we didn’t suffer any major injuries was also pretty huge. After only one day training together we had spent nearly six hours paddling, trekking, biking, climbing and running and we had finished altogether as a unit. What a feeling! After having this adventure race suggested to me by my fabulous physio Emma McCosh over a year ago, I couldn’t quite believe the weekend had finally arrived. I had butterflies and panic stations all week but once we got to Whakatane and registered, the nerves disappeared to be replaced by excitement and anticipation. I knew I had done everything possible to ensure race day went well, as had my team mates. The kayak leg was fantastic and I’m sure it looked like Penny and I had been paddling together for years. We had had two training paddles together so it was more likely that the synchronisation was to do with having known each other for over 25 years. When I yelled “Paddle! Paddle! Paddle!” she didn’t even bat an eyelid (how I know this is debatable since she was in the front of the kayak at the time). It felt like everything about the race ran smoothly, from the hydration and food supplements to the navigation. Our team seemed to gel well considering we had had so few training sessions together. The terrain was challenging but nothing we hadn’t come across before in our own individual training to the point where I thought halfway through we really should have signed up to do the medium course! I feel it’s always good to start at the bottom and work your way up so Spring Challenge will be the next big event and maybe that can be the medium distance! When we came off the epic waterslide and I realised we were almost finished, I felt so elated but also a bit sad that this amazing experience that I had been working towards for so long was almost at an end. The team run across the finish line was a pretty special moment as was seeing Emma waiting for me with a glass of wine to celebrate our achievement. A huge thanks has to go to the Alterno Foundation for our sponsorship. The monthly blogs and Out and About reports have been fun to do and hopefully have been an inspiration to other women to not let injury and /or illness get in the way of having a go at something completely outside your comfort zone. I am keen to keep adventure racing, keep pushing my limits and trying new things. The sky is the limit and while it’s still a heap of fun why not?? Wow! 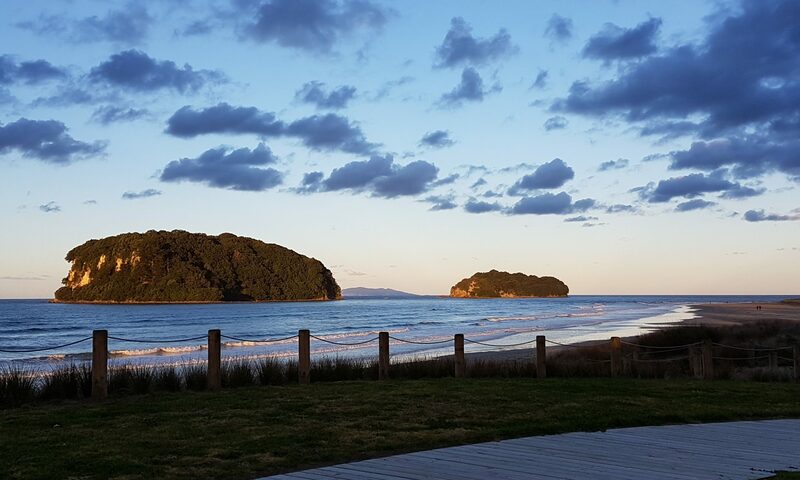 What a brilliant weekend in Whakatane after so much time spent planning, training and anticipating how the event would be! Having spent my teenage years in the Eastern Bay of Plenty I always enjoy returning to the area and I nearly felt like a teenager again coming down the waterslide in the final mystery activity. Any pre-race nerves I’d had quickly dissipated once Kait and I settled into the kayak leg – we’d decided that after 20 years of friendship, we’d still be talking afterwards despite whatever mishaps might occur. Fortunately, following her instructions to just keep paddling (or was that ‘paddle like F#@K??!!) while she steered from the back we managed the waves to and from the shore without capsizing. It was 11 months to the day since I broke my elbow and while it still niggles at times, it gave me no trouble during the race. It’s fantastic to have completed my first team event with these great women and what a way for Abby to spend her 15th birthday! I loved completing the different disciplines but was pleased the others were happy to do the navigation. While we didn’t train together as a team, the communication during the past months has been stellar and ensured we were all in a similar mindset for the big day. It was awesome to reach the finish line (within the time hoped for) and to raise a glass to celebrate not just our achievement on the day, but the journey we’ve had individually and as a team over the past 12 months. It was great to look around and be inspired to try and get a bit fitter and faster in the future, and to also appreciate the Whaiora Spirited Women event where so many women can get out there, challenge themselves, and to have so much fun with their friends. I’m not sure what my next challenge will be, but I absolutely loved this event and am grateful to the Alterno Foundation for their sponsorship of our team in this unforgettable experience. 12 months ago, I was out for lunch with my aunties and they were telling me about their friend Emma McCosh who was competing in the GODZone Adventure Race, and how they thought that adventure racing might be something that would appeal to me. As soon as they started talking about the components involved I was hooked. Fast forward and a month later Megan asked me if I would like to participate in the Whaiora Spirited Women adventure race as it had just finished in Taupo the week before. I responded with a “Sure! I’d love to!” not really knowing what I was getting into but totally willing to give it a go anyway. Training started slowly with occasionally walking small distances on the weekend, doing ten minutes on a stationary bike 2-3 times a week, and keeping up with my weekly netball training. About three-quarters of the way through 2017 I started losing my motivation for training, as I had no one in my family who wanted to do it with me and it’s rather boring doing it by yourself, so decided to vocalise my problem to my aunties. From there we came up with a plan of doing some sort of team training every weekend. Now the race has finished, and all the stress has been lifted off my shoulders, it also means that it’s time to look back on the experience and to the future. I loved the experience of the race, the adrenaline running through me and the presence of nature. I loved the training that we did leading up to the race and getting to see all these various places that I wouldn’t have seen before agreeing to participate in Spirited Women. The sense of achievement that surrounded me once I had finished the race was indescribable. Admittedly I almost passed out an hour later and had to go back to our motel for a nap but that’s all a part of the journey isn’t in? I want to participate in more adventure races in the future and maybe look at competing in adventure races that last a few days like the Coast to Coast. When I submitted the essay for the Alterno Foundation sponsorship earlier in 2017, I began by saying “I am not an adventurous person”. Over the past 12 months, that has begun to change. While ‘adventurous’ is still not in the top-ten list of adjectives to describe myself, my attitude towards adventure and being outside my comfort zone has definitely changed. I have done so many things that I would never have thought myself capable of, including the Whaiora Spirited Women Adventure Race. When this journey began, almost a year ago to the day, I was overweight, constantly in pain and living a very sedentary life. Watching Kait’s determination in her rehabilitation post-accident was inspiring and I wanted to make sure that I could be 100% supportive of any activity she wanted to do to help her build strength and stamina. Little did I know that I was, in fact, rehabilitating my own lifestyle. Having not ridden a bike since I was a teenager, mountain biking was the skill I found the most challenging to develop. I still feel very cautious and a little fearful of accidents but I love the feeling of being on the bike and exploring lots of new places. I have a list of all the trail rides I want to do and have started putting plans in place for at least the next five years! While the Spirited Women adventure race was the end goal, the journey was about reconnecting with life – seeing new places, building new friendships, strengthening relationships and growing in confidence. Training was never a chore. Each undertaking was a chance to spend time exploring and improving. It was exciting to repeat activities and courses and know that I was fitter, faster and stronger. Participating in organised events along the way gave us independent measures of our progress and helped to keep the motivation up. And while race day was not without its mishaps and there were a few minor injuries sustained, we did meet our goal of arriving at the start line whole and finishing in much the same state! Knowing that we achieved this goal successfully has definitely given me the confidence to want to continue doing more adventure activities. I am so inspired by all the women we saw out there on Saturday. Nothing seemed to be a barrier – not age, height, weight, fitness or experience. Every woman was giving her all in pursuit of something – self-awareness, social connection, success; whatever it was, the joyfulness was tangible and infectious. I am so proud to have been a part of something incredible. Huge thanks to the Alterno Foundation for the privilege of being the Alterno Accidentals in 2018. Raincoats and trig stations, Gu chews and jet planes…these are a few of our favourite things! It’s so hard to believe that there is only one month to go until the Whai Ora Spirited Women – All Women’s Adventure Race. We are so excited about getting down to the business-end of training and beginning to bring everything together. The past month has been about longer distances, increasing our activity time to build endurance, finalising clothing and footwear choices and experimenting with nutrition options. The training programme provided by James Kuegler has really helped to create a framework in which we have worked as a team and has also provided a way of being accountable to each other, given the issues we have with distance and team time together. Because of our infrequent opportunities to prepare together as a team, we have had to build a sense of trust that each member is doing what is needed to ensure that she is ready come 17 March. The Waihaha Link track on the Great Lake Trails. We walked it first and then rode it the following weekend. Beautiful views of the Tieke Falls on the Waihaha River. Training over the past month has seen us walking, biking and kayaking in a full range of weather conditions, from scorching hot days to pouring rain. We are now confident that our raincoats and shoes (and most importantly, socks!) are up to whatever weather conditions we might experience in Whakatane on race day. One of our most important discoveries has been that waterproof shoes aren’t really all that desirable when your shoes become squelchy swimming pools. Shoes that allow the water to drain out are much easier to continue to walk in once wet! Kait’s experiences with blisters have seen her explore preventative options from plasters (which don’t really stand up to the challenge once they are inside soaking wet shoes and socks), hikers wool and finally the magic of injinji socks. They are the creepiest-looking things ever to walk the earth but, boy, they are effective in preventing blisters! A wet walk on the Orakau Link. Best advice ever: There’s no such thing as bad weather, only bad clothing choices! Abby has spent a lot of time with Kait and Megan over the past month with regular training in either Taupo or Auckland. One of the great things about getting out and about is the opportunity to explore new places – mountain biking at Totara Park, the Auckland Coast to Coast walk, Rogaine at Waitawa Regional Park, the Great Lake Trails in Taupo – each location has introduced us to new scenery, challenged us with hills or distances covered and shown us a whole lot of fun along the way. In fact, saying that we have to go out and train is really just an excuse to find somewhere new to go! It is especially fun to be exploring places that have been on our respective doorsteps for years and we have had neither the energy nor the motivation to get out amongst it. Late in January, Megan and Kait had the incredible fortune to play shuttle drivers for the Jack Wolfskin’s Girls team on a GODZone training weekend. Watching the four women interact and work together as a team was such a valuable experience in our own preparations, especially noting the laughter and teasing in amongst the business of getting sorted. While our own team challenge is far less intense than GODZone, the building blocks for adventure racing as a team are the same and to see the advice we have been given in action was priceless. It was also interesting to see how each member of the team managed their food and fluid requirements. This has been quite an interesting process for each of the Alterno Accidentals members as we have increased the distances and time on our feet in preparation for Spirited Women. Each of us has quite different preferences and needs and practicing what to carry, how much to carry and when to consume has been a training mission in itself. Abby drinks a lot of fluid, Megan never drinks enough and has to be reminded to drink. Penny prefers just water, as does Kait although she has been pleasantly surprised by the improved recovery offered by consuming electrolyte hydration support. Even simple things like managing the bottle size for the ease of making up the powders or using tablets has been something to practice. If the bottle is too small or too big then the solution dilution is affected. 500mls and 750mls seem to be the best sizes for making solutions on the go. If there is time to prepare in advance then it is easy to make the solutions as required in a jug and decant into whatever you are carrying. And don’t forget the all-important consideration of flavours! Take care if using effervescent tablets – they really like the opportunity to sit still while dissolving! Em’s Cookies have proven to be favourites although we can only manage the bite size portions. The large ones are really a whole meal! We also tried out the Pic’s Peanut Butter slugs with great hilarity. The consensus is that they are better with crackers than on their own – the crackers at least allow you to avoid getting the slug stuck to the top of your mouth! If you haven’t tried them, and you are a fan of peanut butter, they are definitely an experience not to be missed! Megan is not a fan of the gels and neither is Abby but Kait’s favourite flavour is espresso. The chew blocks are a good alternative to gels – clean, easy portion measures and soft, they dissolve easily with one or two bites. They aren’t sickly sweet and are a good source of caffeine if needed. The nutrition suggestions on the PURE website have proven very helpful as guidelines for each team member to develop a plan for race day that is easily digested, can be carried and will withstand being knocked around for the duration of our adventures. Minor mechanical issues with some of the bikes over the past month have been a timely reminder to ensure that our equipment is in good condition for the event. A broken chain and flat tyre have ensured that we carry a chain breaker (and know how to use it!) and some team members have even invested in chain links just in case; carry a pump that is set up for whatever valves your tyres have and if needed, make sure you have a spare inner tube. We were given very good advice to ensure that the spare tube is wrapped in a cloth or oilskin inside your pack or tool kit bag – nothing worse than needing it and finding out that rubbing against the side of the bag has worn a hole in it! Check and see if the team has the same size wheels – no point in only carrying one spare tube that won’t fit. Tyre levers and allen keys are useful items too. Our accommodation is booked, our yoga session locked in and in 25 sleeps we will be in Whakatane ready to go. Abby has her 15th birthday on race day and we intend to make it a birthday that she will never forget! The last two months have flown by in a flurry of activity, adventure and indulgence. Annual holidays and beautiful sunny weather have seen the Alterno Accidentals members venturing further afield as they train, alongside commitments to family and catch-ups with friends. Megan and Kait have done lots of work building their navigation skills over the past two months with rogaines in Taupo and at Duder Regional Park (Auckland) with Rachel from Navigation North, as well as working through the orienteering courses set up at Mahurangi Regional Park (north of Auckland) and Te Mata Peak (Havelock North). In an effort to become more familiar with using topographical maps, they purchased the maps for Taupo and Whakatane and set about plotting a couple of short kayak trips on Lake Taupo, practicing using the compass and adjusting for the declination as well as taking a bearing. They were very happy to have the knowledge gained from Rachel’s navigation workshops and some extra tutoring from adventure racing legend Debbie Chambers to get them on their way. If navigation is something new for those taking part in Spirited Women this year, be aware that it does take a little bit of time and head space to work through figuring these things out. Our navigators have learned not to skimp on the time invested to hone these skills. They then headed up to Northland to ride the Pou Herenga Tai Twin Coast Trail from Opua on the east coast to Horeke on the west. This 87km ride takes cyclists through beautiful scenery on mostly Grade 2 trail (with a short Grade 3 section) and is very achievable. Happily there were no major incidents on the trip for either Megan or Kait – hydration and nutrition were well managed and they even managed to lend a hand to another rider who had a flat tyre. Sadly, the pump on the hire bike she had rented was not set up for the valve on the tyre – frustrating, though easily solved. It is definitely worth checking this in your preparations. For a full report of the trip, feel free to look at the Out and About section of the blog. finishing with a well-deserved beer at the Horeke Tavern. A trip to Northland wouldn’t have been complete without a visit to the newly opened Waitangi Mountain Bike Park. What an incredible community resource! Do go and check it out if you are up in that part of the country. The wide range of trails ensures that there is something for everyone and there were certainly some thrills had. It was very exciting for Megan to realise how far her confidence has grown since her first ride back in April 2017. One of the tracks, named Ruarangi, was shown on the map as being a Grade 2 so Megan confidently suggested that they ride that track. Ruarangi is a downhill return after a uphill climb on the track named Hua Hill (described as a mellow gradient climbing trail. In the words of our Tui comrades – yeah, right!!) Had Megan read the full description of the trail instead of just relying on the map indications, she might have changed her mind about riding Ruarangi but what a rush! The Park description: The top half is reasonably mellow (hmm, there’s that word again! ), but features some great berm corners. The bottom half edges towards Grade 3 with faster sections and some table top jumps.” Faster sections – that’s a bit of an understatement! This was definitely Megan’s most technical ride to date, albeit short. Even Kait exclaimed on completion that at one point, coming off a jump, her bottom and both feet left the bike. Woohoo! Miraculously, however, there were no spills for either team member. On the subject of spills, the curse of the Accidentals did strike again over the holiday period with Kait taking a tumble during navigation training on Te Mata Peak (Hawkes Bay), Abby hitting the dirt on the Rotary Ride, (Taupo) and Penny hurting her foot (Wellington). While so far having avoided an accident, Megan did manage to come down with a dose of shingles, which slowed down her training somewhat. So while Megan and Kait headed north for their holiday, Penny headed off to Mt Maunganui with family and friends, getting a number of ocean swims under her belt over the December/January period. Abby went south to the Manawatu with her family and a highlight for her was going hunting with her dad. Family holidays for Abby also meant spending some time with Megan and Kait in Taupo, making three out of four members for a number of training events. But where’s Penny?? The mission of getting all four team members together in one place at the same time has continued to be a challenge so the team had to get creative. Where’s my team? Where’s Penny? Thanks to technology, the Alterno Accidentals have undertaken virtual training using Map my Ride, WhatsApp and a combination of texting and calling. Penny reckons it’s better than the real thing! Then, by some cosmic alignment that can only be described as a Christmas miracle, all four team members were in Auckland at the same time for one day! Finally we were able to meet together and we spent the afternoon kayaking at Umupuia Beach (Duders Beach – to the east of Maraetai with Duder Regional Park on the headland immediately to the east). This was an extremely valuable opportunity to introduce Abby and Penny to each other and to sort out our kayaking pairs. Santa had been very generous and brought Megan a Viking 2+1 kayak for Christmas so we took that out on the water as well as two single kayaks. As a team we tried every combination of pairs and well as every combination of position in the kayak – front or back. It was a very important process to go through. Since the person in the front is responsible for setting the pace for that kayak, twe needed to make sure that the person behind would be able to be sustain it. And since adventure racing is a team event, there was nothing to be achieved by having one crew that was really fast and second crew that was slow. Interestingly, we also discovered that some combinations made it very difficult to steer the kayak. This was particularly noticeable with Abby at the back and Megan at the front. Luckily, an incoming tide and an onshore breeze meant that there was no risk of heading out to sea, which was just as well since that was the only direction they could make the kayak go! Jokes aside, knowing how the team will pair up in the kayaks and having had the chance to practise in these pairs, in the type of kayak that will be used on race day has reduced a significant amount of stress for team captain Megan. Biking and trekking really rely on individual competence and fitness and as such, team members are individually responsible for building their skills. But the kayaking really needs an opportunity to be developed collaboratively. Come race day, we’ll be ready! It’s hard to believe that it has been a month since the last blog post. And we still haven’t managed to have a team training session with all four members! Despite that, each team member is continuing to work hard on developing and consolidating their own fitness and skills. This business of living in different places certainly makes it much harder to get together. Roll on the Christmas break so that we can finally get sorted! By the time this blog goes online, Penny will have completed the half marathon in Queenstown, undoubtedly in a time that will make the rest of the team feel nervously unprepared! You will be able to read all about her trip soon in the Out and About section of this blog. Over the month she has also continued with her mountain bike training and walking, in anticipation of Queenstown. Megan, Kait and Abby have been working on team building and recently completed the Lactic Turkey P6 Adventure Race. Megan’s niece (and Abby’s big sister) Sydney rounded out the team of four. Held at Atiu Creek Regional Park, north of Auckland, the race involved trekking and mountain-biking (both with navigation), tubing and mystery activities. Abby and Sydney have previously completed the Xterra Auckland Hunua event with Megan and Kait so the team dynamic works pretty well. However, this was a very different kind of event and the first time that Abby and Sydney had been on bikes in a ‘race’ situation. The race was a rogaine so each stage had checkpoints to collect within the total 6-hour event length. It was also a new experience to be in an event that lasted for that length of time. Thrown into the mix was a range of fabulous mystery activities that, aside from being lots of fun, mixed up the time on bikes and walking and allowed us to work on team dynamics. Simple things like how would we pair up in paired activities? Given that the kayaking leg of Spirited Women is two pairs in kayaks, this is something important to consider, and definitely one of the first things we will need to decide when the team has its first training session. We are also very conscious of the age difference and familial relationships. It is important that Abby feels that she is a bona-fide member of the team, valued for her input and skills, and not ‘parented’ all the way through the event. Both Sydney and Abby are involved in tramping with school and it was great to see Sydney apply her map-reading skills in the navigation requirements. Kait and Megan have developed good communication around navigation and while Kait is the lead navigator, she is always willing to engage in a discussion or ask for a second opinion. One such situation occurred in the mountain bike stage when the team couldn’t find a checkpoint. A re-think of the team’s position relative to the geographical features resulted in success – what a great feeling! We were very pleased with how we went over the course of the day and thrilled that our results reflected our efforts. One of the areas that we still feel unprepared in is how to make the right strategic decisions regarding route choice when navigating. Of particular importance in a rogaine, we aren’t sure we got that quite right in this event. We decided to go for a checkpoint further away that was worth more points but ended up travelling quite some distance, maybe at the expense of then having the time to collect other checkpoints. This is probably a skill that develops with time and experience, and by trial and error. To help build this skill, Megan and Kait have completed two rogaines run by the Taupo Orienteering Club around the Taupo town. These monthly events can be done on foot or by bike and are a great opportunity to practice navigation. As a training exercise last weekend, Megan and Kait took one of the maps out and completed all of the checkpoints, not timed as in a rogaine but just to see which routes between checkpoints were the most efficient and effective. It would be great to have some discussions with experienced navigators about how to make these sorts of choices. There are so many factors that have an influence – team fitness and speed, terrain (including elevation), time available, how many other checkpoints are enroute, and perhaps the points on offer. Understanding these factors and being able to apply them quickly would surely improve the team’s success. Another area that would benefit from concentrated effort, as noted by all team members on the day, is hill fitness – on the bike and walking. And the best way to do that – ride and walk hills! To assist with making progress on that goal, Megan and Kait completed the 16km Tikitapu Trail Run/Walk as part of the Tarawera Trail Marathon and 50kms event. A more comprehensive write-up of this excursion can be found in the Out and About section. It was an outstanding day and there were lots of hills to walk! Kait has also been doing some reconnaissance work to find other tracks to walk and ride. She rode the Whakamaru to Mangakino section of the Waikato River trails, a 24km return trip which she is keen to share with other team members. She has also taken up the Tauhara Tuesday challenge laid down by Emma McCosh of Fit to Live to climb Mt Tauhara every Tuesday evening between the beginning of November and Christmas. So far she has completed the last two weeks and has every intention of continuing until Christmas. Go Kait! The question of managing hydration and nutrition while training and competing has been one that has come up a number of times within the team. Having never exercised to a degree where anything more than water has ever been required, it does feel like whole new area for investigation. The team name ‘Accidentals’ is in part related to the profession of two members and the two dentists in the team have been in discussion about the oral implications of electrolyte supplements and energy gels. Having seen the effects of these products on tooth enamel in athletes’ mouths, there was some reluctance to use anything other than water when training and competing. Kait’s suggested compromise – ensure that every consumption of gel or solution is followed by plain water to reduce the likelihood of the acid (in anything fruit-based) and/or sugar causing decay. Also, since a dry mouth can be just as problematic as one hydrated with electrolyte solution, there’s another reason to keep up with the water. Obviously every person has to find what works according to the needs of his/her body and the demands of the activity. A conversation with your own dental professional is advisable but consider that rinsing with water is cheaper than fillings! Megan is battling some on-going niggling injuries which are creating a few issues in training and completing longer walks particularly, but dealing with them is helping to build physical and mental strength and resilience! She recently spent one of her rest evenings attending the Gutsy Girls Adventure Film premiere in Auckland and saw multiple examples of physical and mental strength on display. What a great collection of beautiful films about incredible women doing extraordinary things! The film was seen by Megan and Kait and Penny, all on different evenings and in different cities but that still counts as a team bonding exercise, right? By the time the next blog is posted in January, there will definitely be stories to share about our team training exercises. Until then, we will keep adding to the Out and About section with write-ups of our adventures. Wishing you all an adventure-filled summer season!